Did any of you get out for some Black Friday specials last week? Hopefully you found some bargains and can now focus on your holiday decorating. I try to avoid the crowds and spent the Thanksgiving weekend finishing up my decor. Usually I have a plan, but ended up changing what I had in mind for my Christmas mantel. My glitter houses were going to grace the mantel, but I ended up creating a snowy village with a Scandinavian vibe. 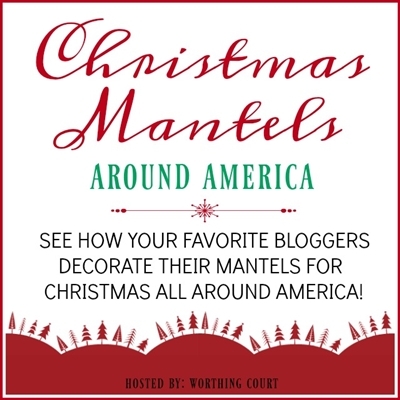 My Christmas mantel today is part of a showcase of Christmas Mantels Around America. A special thanks to Suzy at Worthing Court for organizing the holiday hop. See how bloggers across the country decorate their Christmas mantel; links at the end of this post. A trip to the store was supposed to result in one or two more glitter houses, which I had in my shopping basket ready to go. But then, I walked past the store’s wooden crafts aisle and spied shelves with the cutest wooden houses standing at attention. 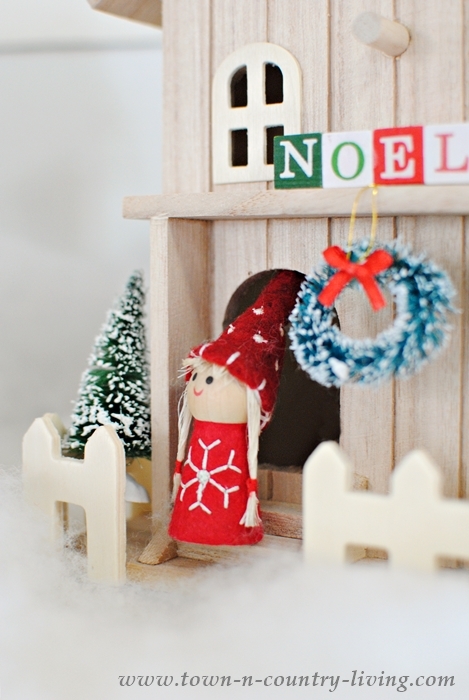 At first glance, the little wooden houses reminded me of Scandinavian Christmas decorations. 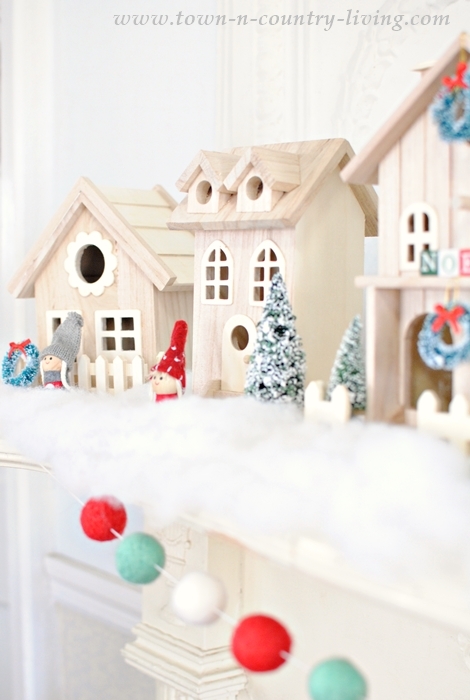 A closer look revealed what they truly are … bird houses! I told myself the little bird holes are simply round windows and grabbed several, putting the more expensive glitter houses back where I found them. 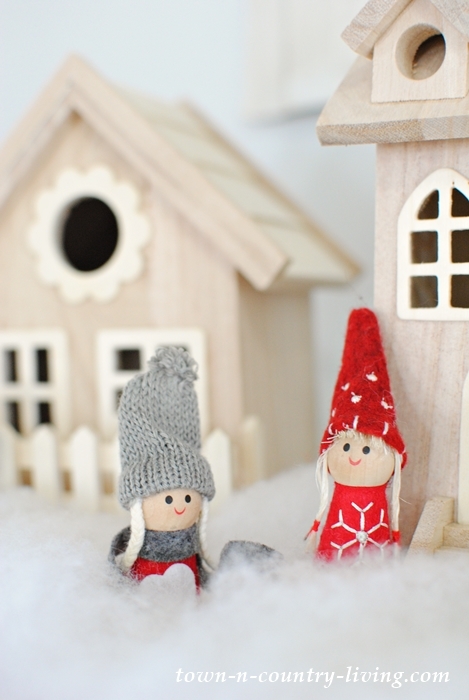 My mother used to collect wooden Nordic figures for Christmas. Luckily, I found miniature wooden figures that looked similar to hers, only smaller. 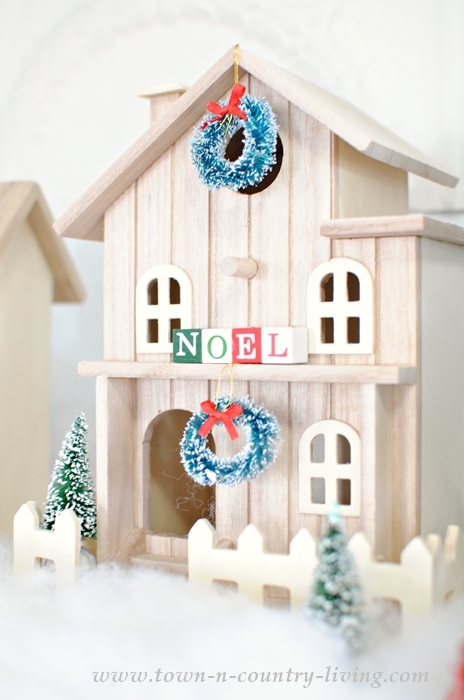 It was so much fun choosing little wooden people and other miniature decorations for the houses. Hubby thought I should paint the houses, which I considered for about 10 seconds. Leaving them plain creates a simpler scene and allowed me to get more creative with decorations for each house. 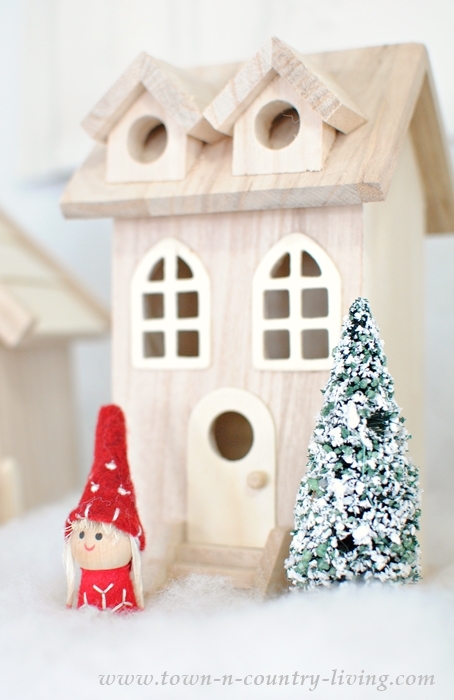 My Scandinavian style snowy village is perhaps the most fun I’ve ever had decorating my Christmas mantel. 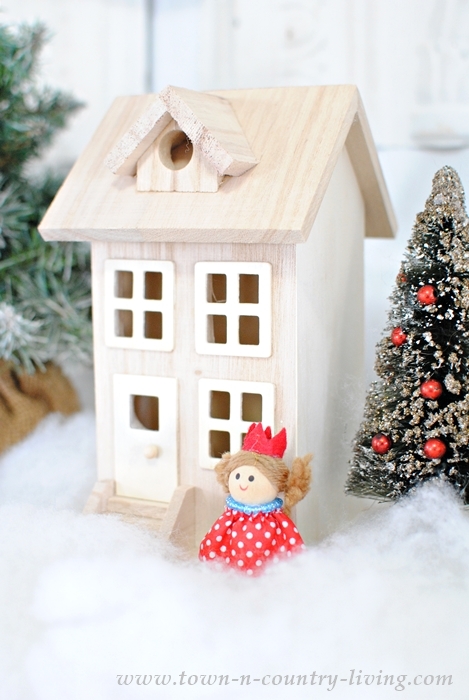 Placing the figures and decorations reminded me of playing with doll houses as a child. 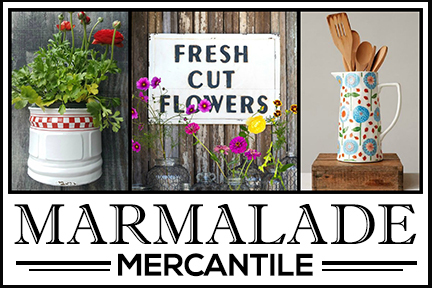 Add the nostalgia of my mother’s Nordic collection and you can see why this was fun for me. 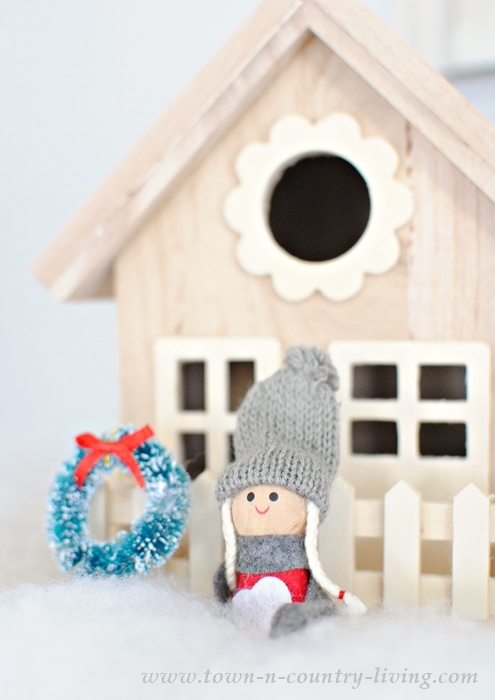 A colorful wool felt pom pom garland adds a little more color to the snowy scene. 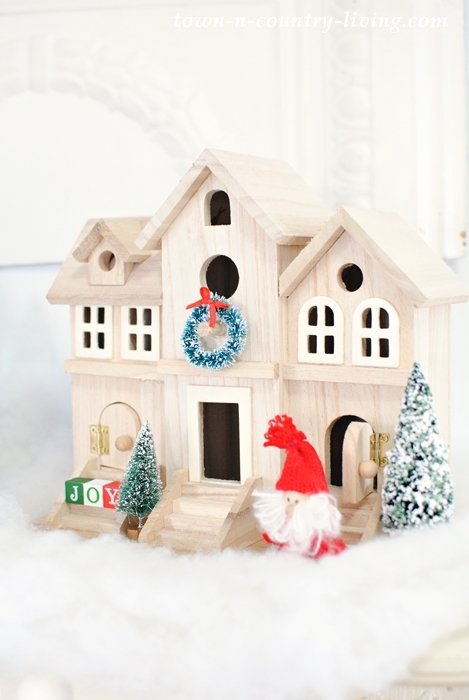 The wooden bird houses, figurines, and miniature decorations are from Michael’s. 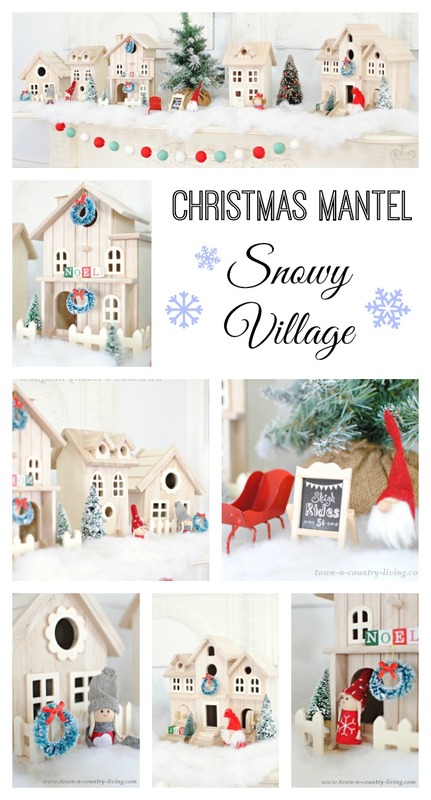 A bag of faux snow stretched easily across the mantel to create the snowy village. The small houses were $5 each, and the two large ones were $10 each. Michael’s carries a variety of styles. Although I still love my glitter houses, it was time for a change on my Christmas mantel. Oh my gosh this is the best yet out of all the mantels! Whimsy and darling..LOVE LOVE LOVE! 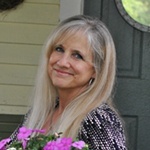 Good morning Jennifer – I adore your Nordic village mantel. The villagers are the cutest ever! Your style always makes me smile. A great way to start the day. Thank-you for showing us your your mantel. It looks cozy, and adorable. all the extra little details were really creative. Oh I love them and am so happy you left them simple wood! What a special way you have them decked out. You are so creative and I LOVE your ideas. Hope you and yours have a wonderful Christmas! This is magical and festive, Jennifer!! And creative. Christmas does bring out the child in us and great memories. I love your snowy village it made me smile and feel warm and wonderful. I love, love, love this, Jennifer! 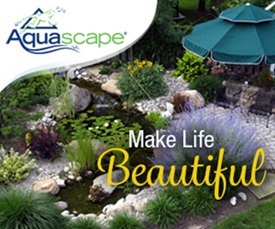 A birdhouse isn’t always just a birdhouse! So creative! 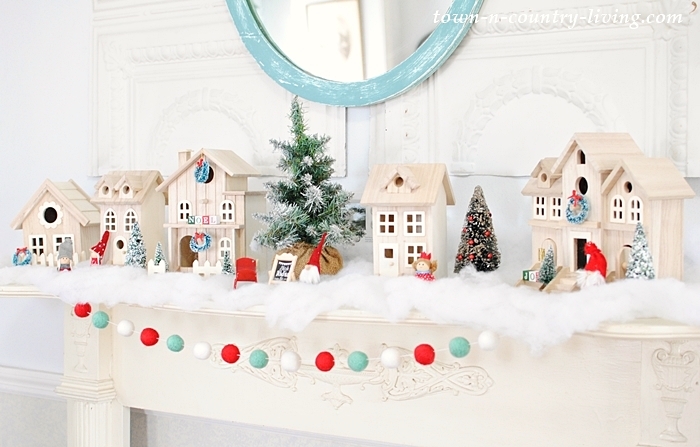 This is the sweetest mantel, Jennifer! I love the village and the soft colors. Can’t wait to see the rest of your holiday decor. I LOVE this mantel, Jennifer! I’ve always loved Scandinavian style decorations and might have to go with this type of theme next year on my own mantel. Thanks for sharing! This is quite possibly the cutest thing I’ve ever seen, Jennifer! So creative and playful too. Great job! The absolute cutest mantel!!!! It just makes you smile!!! Love it! So very cute! Not like anything else I have seen! Love it! Adorable! 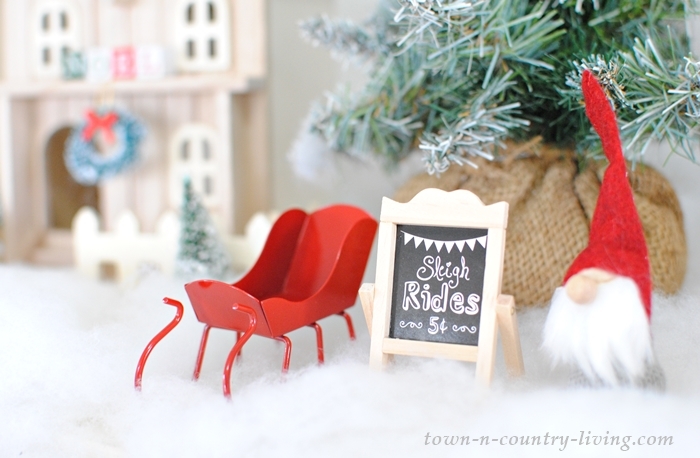 I like the houses unpainted and the decorations that you added to each are perfect. What a great idea. It looks so cute. This is the most precious thing I’ve seen in a while! 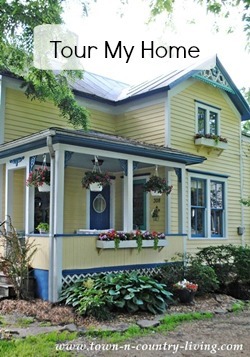 My mom Creekside Village with a ceramic houses and I’ve been trying to find a way to make that tradition my own. Maybe I’ll do with wooden house instead. Plus it gives me reason to play with the dollhouses since I only have boys and no girls to play house with. Your mantle is by far the best I have seen yet this season. I love those houses and the little people. I hope you don’t mind me sharing. Jennifer, your mantel is so beautiful!! I love your style! Thank you for sharing it. So cute and festive. 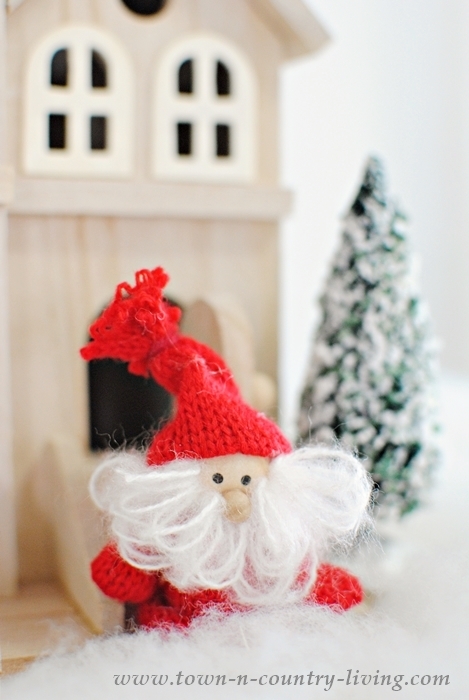 Your mantel is getting me into the holiday spirit! 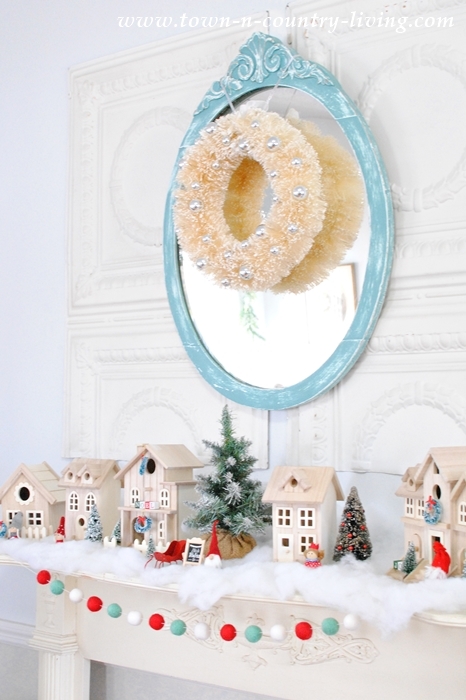 These are all really cute, and make your mantel look so Christmas-y. Love that color coordinated garland too. I love your little houses. I wish I had more room then I could buy some and display them. I agree with your not painting them they are lovely and rustic just as they are.